A man walks to a Best Buy store in Calgary, Alberta March 28, 2015. Best Buy Co Inc, the No.1 U.S. consumer electronics retailer, on Tuesday forecast 2021 adjusted earnings largely below Wall Street estimates, sending its shares down nearly 9 percent. The company said it expected adjusted earnings of $4.75 to $5.00 per share for the fiscal year ending January 2021. Analysts on average were expecting $4.97 per share, according to Reuters. 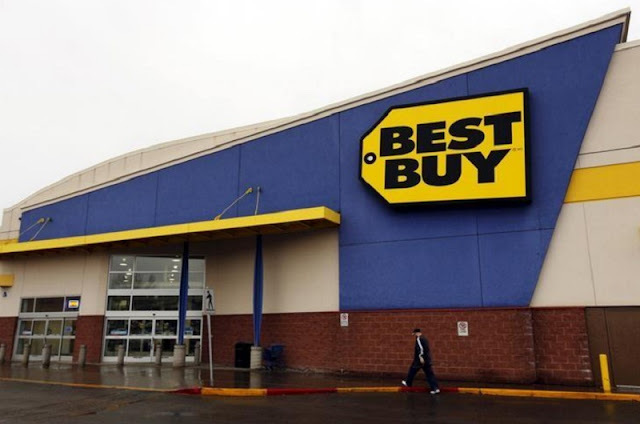 Best Buy Chief Executive Hubert Joly said he did not expect comparable sales to continue growing at a mid-single-digit rate and that the company’s strong second quarter do not necessarily signal a robust performance in the crucial holiday quarter. Best Buy has tried to turn itself around by closing underperforming stores, improving customer service and most importantly, matching Amazon.com Inc’s low prices. Those efforts have helped the company beat analysts’ sales estimates in six of the past eight quarters, a performance unmatched by other electronics retailers. Best Buy also forecast full-year enterprise revenue of $43 billion for 2021. Analysts on average had expected $40.73 billion. The company’s shares were down 8.5 percent at $52.45 in morning trading on the New York Stock Exchange. Best Buy Co Inc, the No.1 U.S. consumer electronics retailer, on Tuesday forecast 2021 adjusted earnings largely below Wall Street estimates, sending its shares down nearly 9 percent. The company said it expected adjusted earnings of $4.75 to $5.00 per share for the fiscal year ending January 2021. Analysts on average were expecting $4.97 per share, according to Reuters.